Object is an SLT Solid Logic Technology) card used in IBM's System/360 family of mainframe computers (first announced April 7, 1964). The SLT module in this example is coated with a red potting compound, indicating an early production unit. Aluminum covers were used thereafter for mass prodcution. 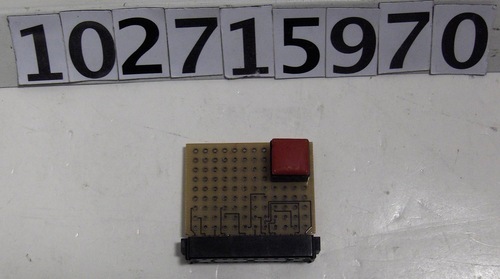 This card is not complete or functional as the SLT module is mounted into a socket which is not soldered to the card, nor is there any wiring from the card to the socket.